Superstar Rajinikanth was spotted at Wankhade stadium in Mumbai watching world cup cricket finals.He was seen with another Hindi actor and politician Vinod Khanna enjoying the India-Srilanka match. The world cup cricket fever has reached its heights with India reaching the finals after a long time and that too the match being held in our very own Mumbai. Many top politicians, President of India and President of Srilanka too are seen at the stadium enjoying the match. From Tollywood, Prince Maheshbabu, victory Venkatesh and Siddharth are seen at the stadium. Several big industrialists including Ambanis, Vijay Mallya, IPL franchisee owners, actors and brand ambassadors were enjoying the biggest match in the cricket world. 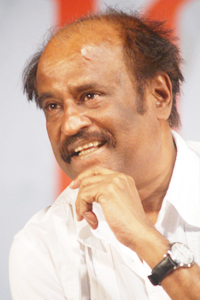 This is however the first time Rajnikanth was found watching cricket match in a stadium in India. Though matches are held several times in Chennai and other parts of the country, he usually stayed away from the matches and sporting events. His presence has come as a major surprise and moral boost to cricket fans too.